Last week, Denver Broncos quarterback Peyton Manning participated in a Q&A with CBSSports.com's Senior NFL Columnist Pete Prisco. One of the most notable questions asked was in regards to how long Manning is going to play. Manning is currently 37 and entering his second season with the Broncos. If Manning plays out his five-year contract, he will be 40 when his deal expires following the 2016 season. But Peyton is clearly slowing down physically. So does he really expect to play four more years? "I really don't know. I take it one year at a time." According to Spotrac.com, Manning is scheduled to earn $17.5 million both 2013 and 2014 and $21.5 million in both 2015 and 2016. But the Broncos can get out of the deal if Manning doesn't pass a physical leading up to one of the following league years remaining on his contract. "My contract is really four one-year deals. I wanted to be fair to the Broncos. I don't feel like I've put them in any type of a bind and I could go out there and play freely." John Elway, Denver's current executive vice president of football operations and former All-Pro quarterback, won a pair of Super Bowls with Denver at ages 37 and 38 in 1998 and 1999. Elway retired before what would have been seventeenth season at age 39. 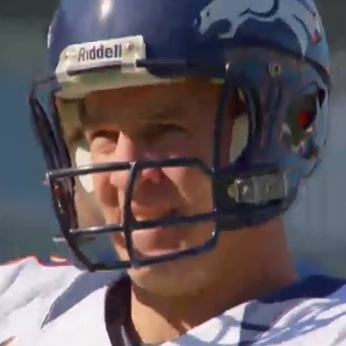 Manning is about to enter his sixteenth season at age 37. "If I can still go out there and perform and be effective, and still enjoy doing it, I will do it." Manning's full Q&A with Prisco can be read at CBSSports.com.